Even Prophets experience feelings of disappointment and discouragement. Reacting to the "unbelief" of the people, Moses succumbed to anger and got himself in trouble with God. But God crowned his ministry and in the hour of his home-going, Angels were his pallbearers. Elijah, discouraged because of the wholesale "unbelief and idolatry" in Israel, felt he had failed in his ministry. He ran at the treat of a woman (Jezebel). God found him pulled back into a cave bemoaning his situation. Reminding him that there were yet in Israel, 7000 who were faithfully holding on to what he preached. God Crowned his ministry and took him home in a chariot of fire. Even so, it was not unusual that the Prophet of this Age, with the burden of the Word on his shoulders, got a complex as a result of the "unbelief" he saw in "Christianity". One after another, church doors were being closed in his face because of his absolute refusal to compromise with "unbelief" in the whole Word of God. He (the Angel rebuking Bro. Branham) said , "Why do you wait for Me to move you every time you move? Where is your reward?" Then I seen. And then said, "Do you remember what Brother Roberson told you in your dream, in his dream, or vision? That you had done like Moses; you forgot the feeling of your people. You forgot the call that I called you to." I let the sick lay. I wanted the Lord to tell me where to go and where not to go. That's wrong. I'd built myself a complex, because the people didn't hear my message. Because of this tremenduous complex and the disappointment in the "unbelief" of the people, Brother Branham was contemplating leaving the Evangelistic field and going back into the wilderness to live. He would come out only when God had given him a direct Message and then go back again. It was at this point that the Lord began to deal with His servant and set him in order. First, The Lord showed him a dream, warning him of what would happen to him if he continued in the plans he was making. God warned him that his family would leave him and he would become a bum. This point was driven home to him when he and his son had stopped into a roadside Cafe for breakfast. Setting in the next booth were two men (bums) whom his son remarked that they looked amazingly like Brother Branham and his brother-in-law (a drunkard). This shook Brother Branham because in the dream his brother-in-law was trying to find a warm spot in a dump for Brother Branham to find shelter and lie down for rest. I went speeding down the road about fifty-five miles an hour in the truck, over the mountains, coming on towards the border, coming home to Arizona, but I was coming now into Utah. .....Somebody went to talking to me, a voice just the same as you hear mine. I know it sounds neurotically. But as I've just got through expressing, "Have I ever told you anything but what was right?" And a voice got to talking. I was talking to it. It said, "Carry out your plans and you'll be like that." I said, "Lord, I don't want to be like that." Said, "Your wife will go too. She won't live up there in them hills like that. And you'll become a bum just as the dream showed you you would." I said, "I don't want to have to live like that. But I was told that You'd call me to be a prophet, and I want to live in the wilderness like the prophet." But I was using my own excuse so I could hunt: my own good. And He said, "But that was the prophets of the Old Testament. You've been called to be there in a much higher office than that. You have more gifts besides that; you was called to pray for the sick and to preach the Gospel in the apostolic forms, you know of greater things, many great gifts." He said, "Why do you wait for Me to move you every time you move? Where is your reward?" Then I seen. And then said, "You remember what Brother Roberson told you in your dream, in his dream, or vision? That you had done like Moses; you forgot the feeling of your people. You forgot the call that I called you to." And as Billy and I started on down the road (see? ), and It (the Angel) said, "I'll give you an everlasting sign." I waited a little bit and nothing happened. I said, "What is the everlasting sign, Lord?" He said, "Look westward from where you're at." I looked, and I just saw a mountain with whitecaps on it. I said, "I don't see no everlasting sign about that". He said, "Your name is wrote all over it." got real weak and I started stopping (the truck). Billy didn't know what was taking place. I stopped and looked up on the mountain, and I seen those seven hills. You want to see something! There was seven peaks on top of a mountain, one mountain, that run for several miles, the last mountain before you go into the other country. No more mountains after that. And it was running from east to the west, the mountain set. And it was snowcapped on top. The first two small peaks, and then a large peak. And then another small peak, and then a larger peak. And then a small peak, and then a great, large, long snowcapped mountain. And I said, "Lord, I do not understand what that means." "How many letters is in your name?" B-r-a-n-h-a-m, M-a-r-r-i-o-n B-r-a-n-h-a-m.
And there was three outstanding peaks. He said, "Those three peaks are the first, second, and third pull. The first one was your first ministry, small hill; then your first pull, pretty high." You know, sign in the hand. Then there's a little interval in there, the time that I was taken off from being too tired. Many of you remember it. And then come the discernment the second pull. Now, I've had another, about... few years here of just kind of little peaks. See, back, like my ministry wasn't yet. And then come the third one. Three is a number of completion. See? The third one. The next peak was five, number of grace. And the next peak was seven, a number of--of perfection, the end. "Six days shall ye labor, the seventh is the Sabbath, the end of the week, the end of time." See? And I stopped and I showed it to Billy. And I looked at them. And He said, "That, let that stand. If there's ever a doubt in your mind, remember this place, come back here." And Billy punched me on the shoulder, he said, "Daddy, look eastward!" And how it ever happened, I don't know, but there on the east side of the road was that burning dump. Miles and miles from any kind of a city, an old rubbish heap dump laying there on the left hand side of the road. I am returning to the field. Amen. Old or young, live or die, I'll obey God until death shall set me free. 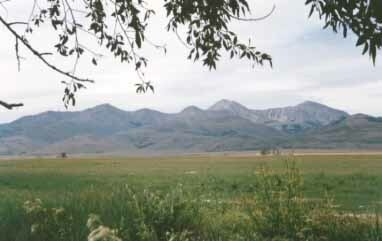 The Seven Mountain Peaks near Lima, Montana, stand today as a mute testimony to a covenant which God made with His Twentieth Century prophet. These peaks testify of his name and his ministry - To God Be The Glory!